Directions: Shell the pecans. Nuts that have been processed in shared mills are probably not gluten-free. You can avoid that by buying them in shells and shelling them yourself. Cut the apples into slices. Put them in the microwave-safe casserole. Sprinkle with lemon juice, cinnamon, and vanilla. Take the millet and grind it into millet flour in the coffee grinder. Take the pecans and grind them up in the coffee grinder, until you have a very coarse meal. (This happens really fast in a Krups. Take care not to make it into pecan flour or pecan butter.) Cut the butter into small chunks. Mix the millet flour, pecan meal, sugar, butter, and nutmeg in a bowl. Put the flour mixture on top of the chunks of apple. Put the lid on the casserole and put the whole thing in the microwave. Set the microwave to run on “high” for nine minutes. Turn your toaster oven to 375 degrees and let it preheat. When the microwave beeps at you, take the dish out and carefully remove the lid. (Pyrex is beautiful. Steam burns are not.) 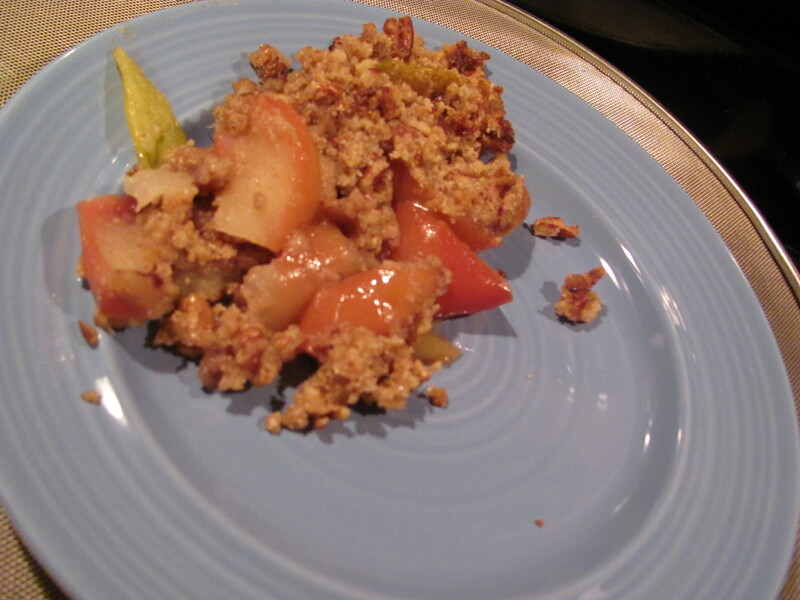 Put the apple crumble dish into the toaster oven for ten to twelve minutes to brown the top. Watch it carefully–nuts burn fast. Cost: About $4.50 for the entire dish. Note about nuts: Unless the package says, “gluten-free,” unshelled nuts are probably not, because they may be processed on shared lines. Shelling them yourself is less expensive, anyway. OLD Pyrex is the most beautiful stuff; made of properly tempered glass. Hold onto those old pieces because the new ones are more inclined to shatter. Kind of like some relationships, eh…? I am drooling over this recipe — thanks for posting it.